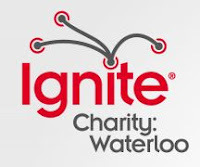 Last night I attended Ignite Charity at The Tannery Event Centre, an event that absolutely "captured the best of charity culture" in our community. For anyone unfamiliar with Ignite, it's an event featuring inspiring 5 minute talks- not unlike the much acclaimed TED talks given to us by The Sapling Foundation with the mission of 'sharing ideas worth spreading'- but this Ignite had the unique mandate of focusing on the passion and ideas of people in the Social Profit Sector (thanks for highlighting this more appropriate term Sara Casselman). Smiling can transform our personal health, our community health, and the very fabric of our society. The world is being changed for the better every day by the courage of children. Accepting homelessness in our community is an active decision, and we can make a different decision. An investment in prevention is an investment in a brighter collective future. Perhaps we shouldn't be so quick to laugh off our addiction to 'busy'. I should have gone to camp. A small, regular commitment to volunteering isn't just achievable, countless people really appreciate it. Charity work is most effective when we respect and invest in the internal authority of a person, group, or country. Until we create a national nutrition program we will continue to have children who go hungry. You don't have to leap far for great ideas about how to get involved in your community. If tithing (giving back one tenth of what you earn) was more widely practiced in North America, the face of our society would be a startling different face. Young people can offer amazing insight and direction when we engage them. The relentless effort of one individual does make a difference. I can be proud to be the mosquito. Thanks to organizers, and tireless community supporters Robb Farago and Popy Dimoulas-Graham, and everyone else who made Ignite Charity an outstanding first for our community! CLICK HERE, and join the efforts of your neighbours in making their community better through volunteerism.